BEIJING (January 24, 2019)—The Singapore International Mediation Centre on Thursday, January 24, 2019, signed a Memorandum of Understanding with the China Council for the Promotion of International Trade (CCPIT)/ China Chamber of International Commerce (CCOIC) Mediation Center to offer world-class mediation services to resolve disputes related to the Belt and Road Initiative (BRI). Under the terms of the MOU, SIMC and CCPIT/CCOIC Mediation Center will jointly establish a BRI Mediator Panel. To ensure a high settlement rate and a high level of user satisfaction with the mediation process, the BRI Mediator Panel will comprise skilled and experienced dispute resolution professionals from China, Singapore and BRI recipient countries. They are selected in accordance with global best practices in mediation. They will also undergo a skills exchange programme specially designed by SIMC and CCPIT to familiarise the mediators with the business and dispute resolution culture of the BRI jurisdictions. 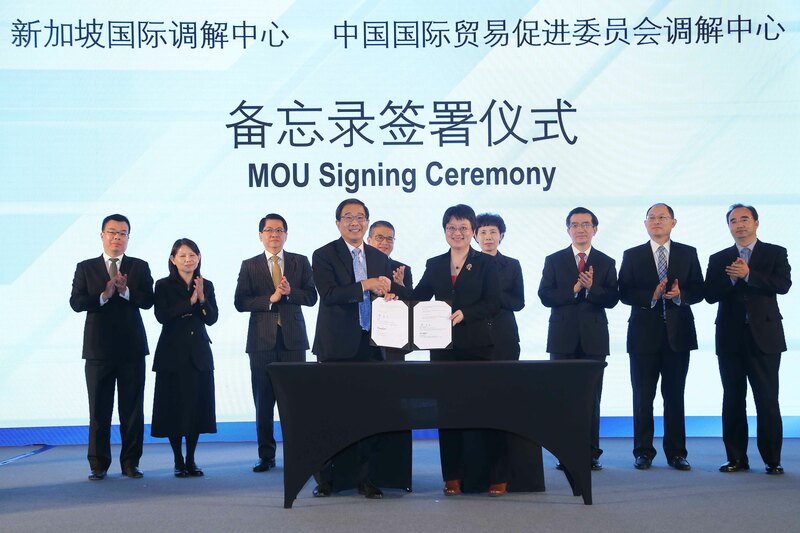 SIMC and CCPIT will also jointly develop the rules, case management protocol and enforcement procedures for BRI dispute cases submitted for mediation. The MOU was inked today at the China-Singapore International Commercial Dispute Resolution Conference in Beijing by SIMC Chairman George Lim SC and Ms Cai Chenfeng, Deputy Chairman of the CCPIT/CCOIC Mediation Center. It was witnessed by Mr Edwin Tong, Senior Minister of State for Law and Health; Ms Gao Yan, Chairman of CCPIT; Mr Stanley Loh, Ambassador of the Republic of Singapore to the People’s Republic of China; Mr Luo Dongchuan Vice President of the Supreme People’s Court of the People’s Republic of China; Justice Hoo Sheau Peng, Judge of the Supreme Court of Singapore and the Singapore International Commercial Court; Mr Lu Pengqi, Vice Chairman of CCPIT; Mr Han Kok Juan, Deputy Secretary of the Singapore Ministry of Law; and Prof Huang Jin, Vice President of the China Law Society, President of the Chinese Society of International Law and President of the China University of Political Science and Law. SIMC Chairman Mr George Lim SC (left) and Ms Cai Chenfeng, Deputy Chairman of the CCPIT/CCOIC Mediation Center, with witnesses. This MOU builds on the agreement signed between the same organisations on September 19, 2017, to promote international commercial mediation amongst businesses in China and Singapore. The partnership has so far seen collaborations on joint conferences and training courses for Chinese legal professionals.